Planets were once defined as any one of the nine bodies that orbit the Sun. Today we know that other planets orbit other stars. in 2006, the International Astronomical Union (IAU) redefined a planet as a celestial body orbiting a star or stellar remnant that is massive enough to be rounded by its own gravity, is not massive enough to cause thermonuclear fusion, and has cleared its neighboring region of planetesimals. Planetesimals are small objects formed from dust and gas as a new planetary system develops. With one stroke of the pen, Pluto, many people's favorite planet, was reclassified as a dwarf planet. There are now officially only eight planets in our Solar System. Planets are worlds unto themselves. They are the canvas on which the diversity of creation can be painted. And in our solar system, they are both the seeds and cradles of life. Everything we see and know in our lives are all part of the planet we call Earth. It is difficult to imagine anything beyond our home world. But as large as our planet may seem, it is actually quite small in the scheme of the universe. Earth is only one of nine such worlds that orbit the Sun. It is also one of the smallest. These worlds, along with our local star, comprise what is known as the Solar System. They range from rocky globes half the size of Earth to giant behemoths thousands of times larger. We have only just begun to explore these worlds. Our knowledge about the Solar System has great leaps in the last few decades, but there is still much to be discovered and much we do not understand. And now, as we pass into the new millennium, we are starting to see that other stars have planets of their own. Terrestrial Planets - Also known as rocky planets, these bodies are composed primarily of rock and metal and have very high densities. They also tend to be relatively small in size and have slow periods of rotation. The terrestrial planets in our solar system are Mercury, Venus, Earth, and Mars. They are the planets closest to the Sun. Terrestrial planets tend to have very few natural satellites, or moons. Of the four terrestrial planets in our solar system, only two have moons. Earth has one moon while Mars has two. Gas Giants - Four of the outer planets in our solar system are known as gas giants. They are Jupiter, Saturn, Uranus, and Neptune. Gas giants are composed mainly of hydrogen and helium and are quite large in size. Jupiter, for example, is 1000 times larger than the Earth. Gas giants also have low densities and tend have a very fast period of rotation. All four of the gas giants in our solar system have ring systems and a large number of moons. This may be due to the intense gravity of these planets. They may have more of a tendency to capture wandering asteroids and planetoids then the terrestrial planets. It is believed that the ring systems may have formed from old moons that were pulverized by the tidal forces of the planets' gravity. Dwarf Planets - Dwarf planets are bodies in orbit around a star that are neither planets nor natural satellites. They are massive enough for their shape to be in hydrostatic equilibrium under their own gravity, but they have not cleared the neighborhood around their orbits. Pluto is a prime example of a dwarf planet in out own solar system. Four new dwarf planets have been discovered beyond the orbit of Pluto, and astronomers believe there could be hundreds more. These bodies are so far away that they are difficut to see even with the most powerful telescopes. Many large telescopes are under construction that may be able to help identify new dwarf planet candidates. Planet formation is still somewhat of a mystery, but most astronomers believe they understand the basic process. The best explanation accepted today is known as the solar nebula hypothesis. In this process, stars are formed from giant clouds of gas and dust known as nebulae. Gravity causes the matter in the nebula to coalesce, or come together. These strong gravitational forces soon causes the central part of the nebula to collapse and form a star. The remaining gas and dust forms a flat, rotating ring around the new star. Eventually the gravity of the star begins to pull matter towards it. Small whirlpools of spinning matter form within this disk. Gravity causes these whirlpools to aggregate into small masses known as planetesimals. These planetesimals continue growing, pulling in the matter around them. Gravity soon pulls them into a spherical shape. These small spheres may collide and merge with others as they grow in size and become what is known as a protoplanet. Sometimes, a smaller sphere of matter may become captured by a larger one and enter into an orbit, creating a moon. Over time, gravity causes the heavier elements in the protoplanets to separate from the lighter ones in a process called uniformitarianism. This forms the planet's metal core, rocky crust, and usually an atmosphere composed of gas. As the star and planets continue to grow, the dust and gas of the nebula begins to thin. Smaller chunks of condensed matter is left over in the outer regions of the disk. These form the Kuiper belt of planetoids and the Oort cloud of comets. Eventually the solar wind from the star will blow away the excess gas and dust. A new solar system has been born. The process is slow and takes millions of years. Many stars have been observed to have flat disks of matter around them. These could very well be new solar systems in the making. Astronomers have theorized about planets outside our Solar System, also known as extrasolar planets, since the mid-19th century. Some of the first evidence of an extrasolar planet was seen in 1916, when Barnard's star was noticed to have an unusually large proper motion. In the past few decades, many other potential planet candidates have been identified but not confirmed. The first published discovery to be confirmed was made in 1988 by the Canadian astronomers Bruce Campbell, G. A. H. Walker, and S. Yang. They observed strange movements of the star Gamma Cephei that suggested some massive object was pulling on it. They proved that it is possible to search for extrasolar planets by looking for their gravitational effect on the stars. Large planets orbiting a star will cause it to wobble as the star and planet orbit around a common center of gravity. This effect can be visualized by grabbing someone's hand and spinning them around in a circle. The force pulls on your arm and tends to pull you off center as you spin. By monitoring the spectrum of a star, we can tell if it is moving toward or away from us. If the star's spectrum is shifted toward the red, it is moving away. If it is shifted toward the blue, it is moving toward us. When astronomers find one of these wobbling stars, they have a strong candidate for an extrasolar planet. 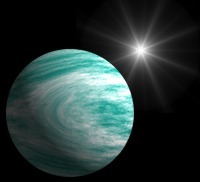 Further observation and testing can prove the discovery of a new planet. New tools such as the Hubble space telescope have revealed that many stars seem to be surrounded by a thin disk of gas. It is believed that this may represent a young solar system being formed. Most of the new planets that have been discovered are believed to be gas giants several times the size of Jupiter. This is because the gravitational effects on a star of a small planet like the Earth would be too weak to measure. Many new instruments are being developed that may make the search easier. New binocular observatories are being developed that will be able to measure the chemical compositions of newly discovered planets. New orbiting telescopes are being planned that may give us our first views of a planet orbiting another star. When these new tools are in place, we may yet discover the first Earth-like planet outside our solar system. The discovery of these planets will be the first step toward finding out if there may be life elsewhere in the universe. All though most planets are found orbiting stars, there are exceptions. There are some worlds that embark on a cold, lonely journey across the cosmos. These planets were formed as part of a star system, but have been evicted from their local system by the force of gravity. If two planets approach each other too closely, the effects of gravity can send one of them sailing out of the system in a sling shot effect. Once the planet has left the system, it will continue its solitary journey for what could be an eternity unless it encounters another star system or other massive object. Astronomers call these lonely planets planemos. 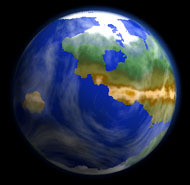 The word planemo comes from the words planetary mass object. It is believed that there may be millions or even billions of planemos wandering throughout our own galaxy. They may account for a portion of the unseen mass of the cosmos known as dark matter.